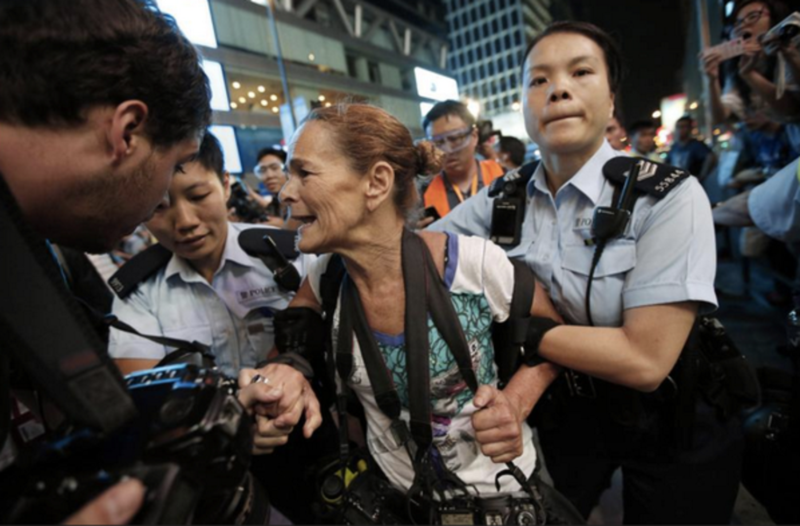 Hong Kong police have arrested photojournalist Paula Bronstein. Bronstein, a multiple award-winning photographer who is best known for her coverage of Afghanistan post 9/11, was covering the on-going chaos in Mong Kong as police and pro-democracy Occupy Central protesters are engaged in a stand-off. According to Hong Kong publication Ming Pao, the Getty Images photojournalist was taken in by the police after she stood on a car, possibly to better capture the action. Although the car was undamaged, the car owner lodged a complaint with the police, and Bronstein was quickly arrested. Earlier in the day, police had cleared out the protesters in Mong Kok, but they returned at night to hold their ground. Protesters are currently occupying parts of Nathan Road and Argyle Street. A Epoch Times reporter on the ground notes that the protesters are keeping the streets occupied by dropping loose change on the ground and “searching” for it, and in the process, blocking traffic. Whenever the police accomplish an action, the crowd would sing the “Happy Birthday” song, which seems to annoy the police. Some drivers don’t seem to mind being held up by protesters blocking up traffic, while others have thrown objects out of their windows at the protesters and have reacted angrily. Story is breaking; check back for updates.